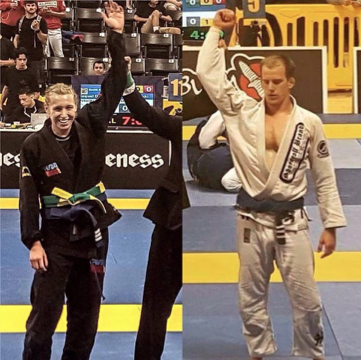 Instructors Alex Coleman and Ryan Mason both competed at the World Jiu-Jitsu IBJJF Championship June 2nd through 5th in Long Beach, California. Ryan was first on the mats as he competed on Thursday, June 2nd in the Men’s Blue Belt Lightweight Division. Ryan won his first two matches, the first via points (6-0) and his second was from a bow and arrow choke. Ryan lost his third match to points in a very technical match which saw a lot of the fight in the open guard position. Alex was second to compete, her first match was on Friday, June 3rd, in the Women’s Blue Belt Heavyweight Division. Alex won her first two matches via submission, the first was by a mounted Arm Bar and the second coming by way of mounted Triangle. Alex lost her third match by points (2-0), but Alex was well ahead on advantage points as she was constantly attacking from top position and looking to set up submission after submission. Ground Control Owings Mills had also sent out a few fighters of their own to the IBJJF Championship, Ryan Makin, Candice Titus, and Alex Pohl.